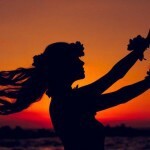 Return flights from Amsterdam to Honolulu, Hawaii from €422! Qatar Airways cheap flights from Scandinavia to Vietnam from €370! Cheap flights from Amsterdam to USA & Canada (incl. Alaska, Yellowstone or Puerto Rico) from €351! Fly on board of Star Alliance from The Netherlands to beautiful Hawaii! Round trip tickets from Amsterdam to Hawaii (Honolulu, Koha, Lihue, Kahului) are now available from €422. For similar price you can also fly to Kahului, Maui. This requires two stops on your outbound flight. (In some cases with long layover in San Francisco. Take this opportunity to visit another city and /or refresh before your next journey.. Great availability at this moment however we do not expect such a great fare will last long. If you like this solution you better hurry up with booking.. This is including all charges and fees as well as checked luggage. As mentioned you will find many travel options at the lowest fares. Look for flights from September to 18th of December 2018 or 6th of January to end of March 2019. Blackout period around Christmas Holidays. Max stay 3 months. Below you can find our booking sample and few travel options. You can book discounted accommodation in Hawaii using this promo codes. Agoda or Hotels.com. 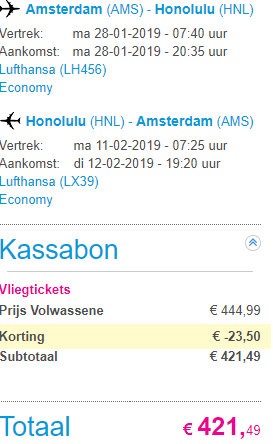 Seems that the Star Alliance promotion is available till 31st of May but expect the cheapest seats will be sold our very soon thought..
Booking sample of return flights from Amsterdam to Honolulu, Hawaii from €422! As per our booking sample you would depart from The Netherlands to beautiful isle of Oahu )Honolulu) on 28th of January. Your return flight back to Europe would be then on1th of February 2019.